Handsome and hard-working, the influential leader Kahungunu supervised building, irrigation, carving and canoe-making. During his life he married nine women, and his courtship of the beautiful Rongomaiwahine at Māhia Peninsula is legendary. Kahungunu’s many descendants – the people of Ngāti Kahungunu – also formed strategic marriages, creating a network of alliances from Gisborne to the Wairarapa. Ngāti Kahungunu are New Zealand’s third largest tribal group. Stretching down the North Island from the Māhia Peninsula to Cape Palliser, their territory is divided into three districts: Wairoa, Heretaunga and Wairarapa. The tribe originates from the Tākitimu canoe, sailed from Hawaiki by Tamatea Arikinui. 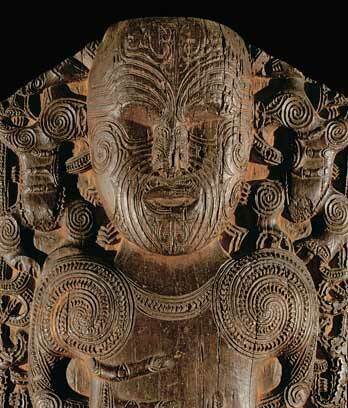 His son Rongokako married Muriwhenua and they had a son, the great explorer Tamatea Ure Haea. At Kaitāia, Tamatea Ure Haea’s son Kahungunu was born. An energetic and talented leader, Kahungunu built villages and irrigated the land. Travelling south, he fathered many children, whose descendants eventually became known as Ngāti Kahungunu. At Māhia, Kahungunu married high-born Rongomaiwahine, having cleverly disposed of her husband. From this famous love match came a line of prominent figures in the tribe’s history. After Pākehā arrived, some tribes acquired muskets. Under gunfire attack from northern tribes, many Ngāti Kahungunu people from Napier escaped to Māhia. Whaling stations were set up on tribal land in the 1830s, and Ngāti Kahungunu began farming and market gardening. Some of the tribe's chiefs signed the Treaty of Waitangi in 1840, but European settlers soon acquired a massive amount of their ancestral land. Pāpāwai village in the Wairarapa became a centre for teaching tribal history, and the site of the Māori parliament. The wealthy political leader Tamahau Mahupuku held grand gatherings there, and would travel to town accompanied by a brass band. In 2013 there were around 61,000 people in the tribe, and 86 marae administered by Ngāti Kahungunu Iwi Incorporated. Cultural ventures included Radio Kahungunu and the internationally successful Māori Dance Theatre.